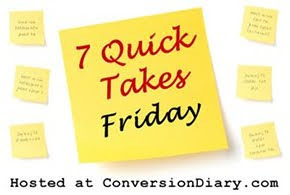 Link up at Conversion Diary, if you complete this on your blog. On Sunday, my mom ran in a half-marathon. I was so proud of her for accomplishing this and my brother and I were at the finish line to cheer her on as she crossed. It took her 2 hours and 42 minutes to complete. (Imagine running for that long!) I mean, I was proud of myself for managing to walk/run a 10K which is “only” 6 miles. A half-marathon is THIRTEEN miles. Just crazy. Things are not looking good for me keeping my job next semester. I gave my boss my work schedule for next semester on Wednesday and she told me she’s trying to work it out but it’s going to be hard. My mom and I have talked about this and we both know I have to focus on school first. Financially, we can survive on just her two paychecks. But it’s really scary to think about not having an income, having three credit card payments, and really having no money of my own to spend. I’m looking into baby-sitting and freelance writing jobs but I’m not too certain I’ll find anything to supplement what I would be making at this job. On the other hand, I’ve seen how much freer my schedule gets without work. I won’t have to try to cram everything into a small window of time. And I’ll be able to give more time and effort into my internship. I’ve had some bad experiences with internships and I’m really nervous about starting this one and impressing my supervisors. So my Fall 2009 grades were finally posted yesterday. And I’m not too happy. I managed 3 A’s and a B+. The B+ was in a class where I had an 89.96 average. That’s right, folks, I was four-tenths of a point away from an A. I also scored an A on the final and was given all of my participation points. Why, oh why, couldn’t this professor bump my grade up to an A? I’m happy with the rest of my grades, though. I had to work really hard for two of those A’s! It was a long and stressful semester and the first time I’ve also worked 30+ hours a week while going to school full-time. I’m a smart girl but I have to work hard for my grades. It doesn’t come easily or naturally for me. But I’m a hard-worker and it’s always so lovely when the hard work pays off in the form of semester grades. This week, I’ve become Facebook friends with three blog friends. It’s quite weird because I feel as if my Facebook life is so much more different and removed from my blog life. Facebook is real-life and I use it a lot to talk about schoolwork, make plans, and complain about life. Most of my status updates are related to my Twitter updates, but in a much more detailed way. So it’s weird but also extremely cool. It’s kind of like seeing these people in their “real life” persona, not their blog one. I like it. Since I’m not anonymous on this blog and could definitely use a boost in my friend count (still trying to break 200! ), add me as a friend. I promise I’ll accept! And it’ll be cool getting to know you, Facebook-wise. Cross you fingers! I’m hoping to be completely done with my Christmas shopping on Saturday. There are a few small items I need to get for my nephew, my brother, and a friend. Those will be easy to knock out. But I need to finish Christmas shopping for my mom. We are a family that likes to go all out during the holidays. It’s the one time of year we really splurge and buy a lot of “want” items. And while I’ve bought my mom a few things, I am nowhere close to being done. I know what I want to get her but haven’t had time (or money) to really go out and buy these things. I can’t believe Christmas is a week away! Where did this holiday season go? I honestly feel that buying candles or bath soaps for a gift exchange is taking the easy way out. Really, where’s the creativity? Just because it’s a group of girls exchanging gifts doesn’t mean you can’t use your brain and come up with something other than the boring stuff. I can’t tell you how many Bath & Body Works gift baskets and Bath & Body Works candles were opened at my gift exchange at work. It may be because I hate getting either as a present. I almost never use lotion, prefer the cheapo $4 body wash from my grocery store, hate candles, and over body spray. (I used it a lot in middle school and brings me back to places I’d rather not recall.) If you’re going to get me a gift, please don’t choose Bath & Body Works. I’m not into that girly-girly stuff. Just get me some chocolate. Please tell me I’m not the only one who feels this way! I enjoyed her list, though, and think it’s someone all women should be aware of. So go check out that post (and her blog! ).